Commanding; dictatorial; haughty; arrogant; overbearing; domineering; as an imperious tyrant; an imperious dictator; an imperious man; an imperious temper. The word imperious is only found once in Scripture and it is related with a whorish woman. One doesn’t have to be a woman of this “occupation” to be imperious, however. 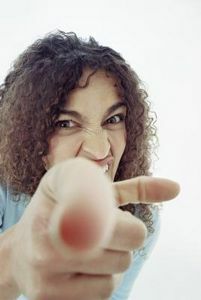 The opposite of imperious is submissive – totally the opposite of our Proverbs 31 wife, amen? As well, it’s totally the opposite of the Lord Jesus Christ. He submitted Himself to His Heavenly Father to the point of death for our sin. No wonder God referred to Israel as an imperious whorish woman! Israel was no longer submissive to God – she went after other gods (thus making her a whore) and she shook her spiritual fist at Him. What can we learn from this woman’s character? Is our heart weak? Are we weak in God’s Word? If we even closely resemble an imperious woman, then our heart is weak. We can only be as strong as our time spent in the Word of God. As well, we cannot be submissive if we are not in His Word either. In fact, if we are not reading, studying and obeying our Bible, we are being arrogant. We think we can do it on our own and we cannot. Without God’s Word permeating every fiber of our being, we will fall into temptation. What becomes of a woman who does not submit to God? She will not submit to her husband. The longer she continues, the more commanding she will become. She will be a “little tyrant” in her home. If a woman turns away from God, she is automatically turning toward another ‘god’! Be careful, dear lady! Don’t get caught in Satan’s trap. You may think you have the right to go against God’s Word when it comes to submission but you really don’t. What you do have right to is the end result of being rebellious. It will only bring heartache in your home as well as “spankings” from God. Better to get that taken care of early in your spiritual walk than to pay the price later. ~Exodus 20:12 Honour thy father and thy mother: that thy days may be long upon the land which the LORD thy God giveth thee. 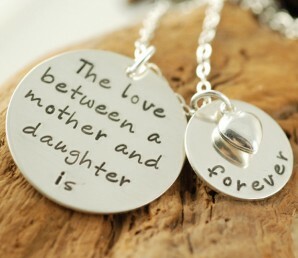 How I wish I had paid more attention to my mother when I was a teen girl. I wasn’t saved at the time and my thoughts only revolved around me, me, and me! 😦 But I can just imagine all the wonderful moments we would have shared together had I been a better daughter. At 4 years … My Dad is great. At 6 years … My Dad knows everything. At 20 years … ‘Oh! Its becoming difficult to tolerate Daddy! Wonder how Mother puts up with him!.. At 50 years … My Daddy faced so many hardships to bring us up … (we were four brothers & sisters) I am unable to manage a single child!.. Don’t take so many years…. Realise it in time! Timothy was young when Paul wrote this. History has it that he was in his early 20’s and that is not far from your age right now. But look at his testimony! Paul was encouraging Timothy not to let “older” Christians look down on his youth but notice the things to which Paul was referring. It had nothing to do with Timothy’s age. He was a young believer but Paul encouraged him to continue to be an example to other believers in: the words he spoke, his walk (his testimony), his love for others, his spiritual growth, and being pure (clean) in all areas of his spiritual life. It doesn’t appear that Timothy let being young in the Lord be an excuse. He pressed forward and was sold out to the cause of Christ and spreading the Gospel. How do you compare to Timothy, teen girl? Are you busy with your friends and life? Do you concentrate on your walk with the Lord? Or is the next movie on your mind? Would you rather go to teen functions at church or hang out at the mall? There’s something in the Bible for every age group. Timothy is a shining example of the fact that young people can be a shining example to other Christians. ~James 3:6-13 And the tongue [is] a fire, a world of iniquity: so is the tongue among our members, that it defileth the whole body, and setteth on fire the course of nature; and it is set on fire of hell. 7 For every kind of beasts, and of birds, and of serpents, and of things in the sea, is tamed, and hath been tamed of mankind: 8 But the tongue can no man tame; [it is] an unruly evil, full of deadly poison. 9 Therewith bless we God, even the Father; and therewith curse we men, which are made after the similitude of God. 10 Out of the same mouth proceedeth blessing and cursing. My brethren, these things ought not so to be. 11 Doth a fountain send forth at the same place sweet [water] and bitter? 12 Can the fig tree, my brethren, bear olive berries? either a vine, figs? so [can] no fountain both yield salt water and fresh. 13 Who [is] a wise man and endued with knowledge among you? let him shew out of a good conversation his works with meekness of wisdom. Today’s cartoon is funny but the “message” is really not funny. Someone who can’t control her tongue has a heart problem according to the Bible. What comes out of your mouth, teen girl? Are your words God honoring? Or are they deadly poison filled with cuss words? Why do you cuss? You must be honest with yourself. Do you think that cussing makes you appear more mature? It takes more maturity to control one’s tongue than it does to “let a cuss word slip”! Do you sass your parents? Do you talk behind someone’s back? All these things are signs of immaturity, not maturity! These things do not make you an adult. In fact, to another adult, acting this way proves that you are still a child with no sign of maturity. 😦 Doesn’t that upset you? It should! I pray that you will read this and take it to heart so you can mature into a beautiful Christian teenage girl who shines Christ’s light to others. If I were to hang out with you, I would be able to tell how much time you spend reading your Bible just by listening to you. It’s not only words that come out of your mouth but words that you put in writing – that “unspoken” word. What you post on Facebook or Twitter also reveals what is in your heart, teen girl. There are teen girls who profess to be saved and yet when I read their Facebook posts, I am ashamed for them! How can you have a fresh fountain of water in your heart yet your mouth releases salt water. Does that sound like it makes sense? Of course it doesn’t! A Christian should not be speaking words that do not honor the Lord, teen girl. Are you guilty of such a thing? The Bible says that we can ask for forgiveness (1 John 1:9) and start over. 🙂 Repent and ask the Holy Spirit to help you get a handle on this problem. God always provides a way out of temptation. But you must decide to say “No!” to being tempted to cuss or talk nasty about someone. ~1 Corinthian 10:13 There hath no temptation taken you but such as is common to man: but God [is] faithful, who will not suffer you to be tempted above that ye are able; but will with the temptation also make a way to escape, that ye may be able to bear [it]. ~Proverbs 19:15 Slothfulness casteth into a deep sleep; and an idle soul shall suffer hunger. Have you ever gotten angry because you flunked a test? It didn’t matter that you hadn’t studied for the test or that you studied very little. You were angry nonetheless, right? You’re angry with the results of your failure to do something you know you should have done. Sometimes you just can’t blame anyone else but yourself, even though you try. When you put your car in Park and you leave it running, you’re idling. Your engine is running but you’re not moving at all. Today’s verse makes it clear what happens to the person whose life is on “Park.” The first part of the verse says that laziness causes a person to sleep. You know how you feel when you’re sleepy? You’re lethargic and you aren’t motivated to do anything. That’s exactly what laziness produces. The verse continues to talk about the person who doesn’t do what she’s supposed to do will be hungry. Everything we choose to do in life is based on this fact. The choices we make are based on this fact. If a farmer doesn’t plant vegetables or care for his cattle, he won’t have anything in the Fall. He will go hungry. It’s the same thing with how you plan your life right now. If you procrastinate and are lazy in your studies, you will not be able to reap a harvest of knowledge at graduation time. Your college choices will be minimal because you didn’t take care of getting good grades early. Good colleges demand good grades from applicants. Do you study because you want the rewards that will come in a few years from now? Or do you live for the moment and suffer the consequences of flunking? It is easier to make the right choices now than to fail in the future and deal with that failure. 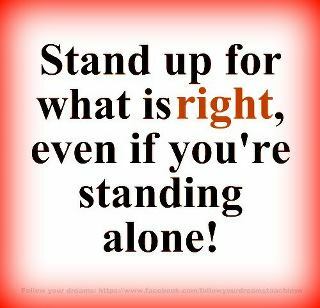 Think twice before you decide to put pleasure over doing what’s right. ~Isaiah 40:29-31 He giveth power to the faint; and to [them that have] no might he increaseth strength. 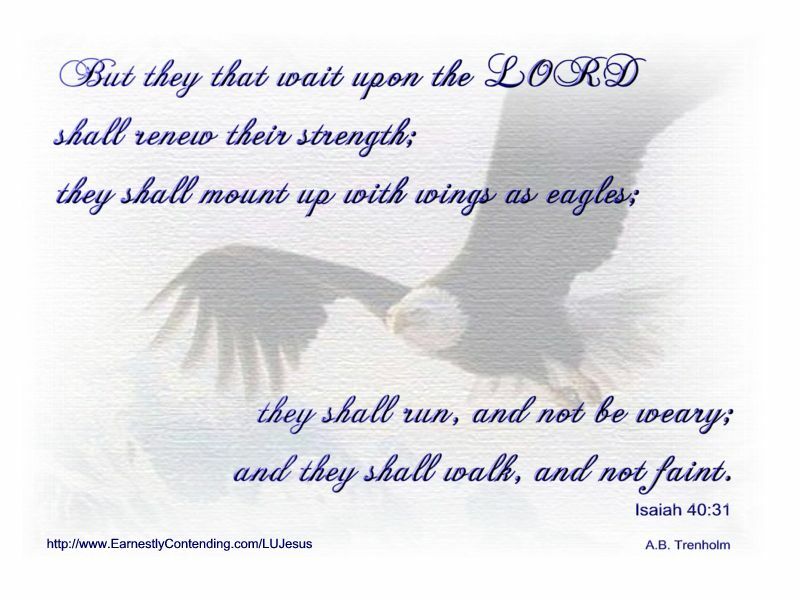 Even the youths shall faint and be weary, and the young men shall utterly fall: But they that wait upon the LORD shall renew [their] strength; they shall mount up with wings as eagles; they shall run, and not be weary; [and] they shall walk, and not faint. God provides us with exactly what we need for the day. It’s a balanced meal with all the spiritual nutrients and vitamins that we need to go through each hurdle and trial. If you don’t start your day off with God’s Word, you’ll go hungry. You will be weak when a situation comes up and you need strength.